Catholic Education in Guelph dates back to January 12, 1854 when the first Catholic school was erected in the Royal City on “Catholic Hill”. Together Catholic clergy, religious and laity established a tradition of providing an education that embraced a high academic standard and a deep commitment to the Gospel. The arrival of the Loretto sisters in 1856 resulted in the expansion of Catholic education. The sisters were instrumental in creating the enduring gift of Catholic Education that is ours today. This past week on February 19, Sister Doryne Kirby, a Loretto sister who taught in several schools in Ontario including Bishop Macdonell, was called home to God. It was a moving tribute at our most recent board meeting as we opened with prayer to hear each trustee recount with deep respect and affection the story of a teacher, who years later, remained etched in their hearts and minds. It struck me that this is a part of our Catholic story that we need to continue to share. The following is a compilation of memories, woven together…of a woman who clothed herself with compassion, kindness, humility, gentleness and patience. Sister Doryne was “a great lady before her time with respect to women’s rights in our church and will be deeply missed.” Legend has it that she was a Rockette before becoming a sister. Her flair for dance, “I Love Lucy” red hair and a personality that was just as bright and fiery, along with her passionate commitment to Catholic education, lit up every room she entered. She was known to literally stand on her head for her students, one day doing a handstand at the blackboard to capture their attention. The tradition of excellence in education was one she took very seriously. One trustee shared, “In grade 13 I took two French courses, regular French and French literature. At the end of the year when it came time for exams and exemptions, the exemption mark was 70%. I had over 90 in the regular French so no issue there. I had 75 in the French literature course but sister called me in and told me I was not being exempted and would have to write the final exam because I had not given my best effort. I was mad at the time but she was right.” And he wasn’t the only one as another of our Trustees shared a similar story of a “heart to heart” in which he was told he was capable of much more than he was showing. Both agreed that this gave them the push to always strive to meet their God-given potential. Sister cared deeply about her students and their families. As a regular attendee at our Bishop’s Dinner for Community Needs, years after her retirement, she had an uncanny ability to remember faces and names and match them up correctly. In addition to her work as a teacher, Sister Doryne served the Church faithfully providing spiritual direction and retreats and as a Director for Social Action, NGO representative at the United Nations, and Coordinator for the Sisters at Loretto College. 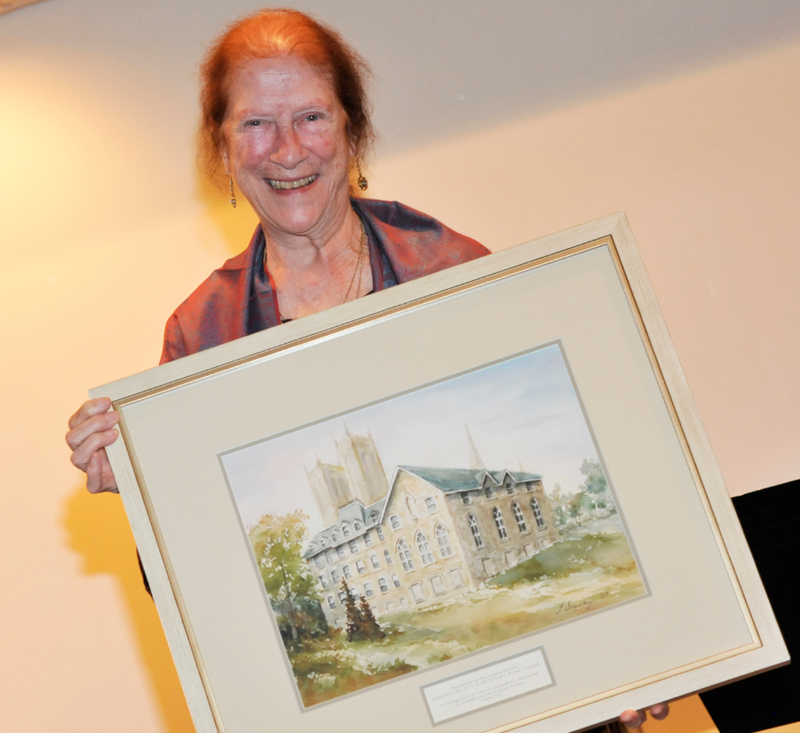 Remarkably she continued her work related to social justice issues until January 20, 2016 when ill health made it necessary for her to move to the Loretto infirmary. Sister Doryne was a steward of God’s purposes in human lives and in our history. She will always be remembered fondly as an amazing faith-filled woman, joyful in her ministry and a member of our beloved Loretto Sisters…a legacy lady! De repos dans la paix Soeur. Sister Doryne at the annual Bishop’s Dinner holding a picture of “Catholic Hill” and the Loretto convent presented in recognition of the Loretto sisters service to Catholic Education. A San Francisco cable car holds 60 people. This blog was viewed about 2,600 times in 2015. If it were a cable car, it would take about 43 trips to carry that many people. There were 12 pictures uploaded, taking up a total of 20 MB. That’s about a picture per month. The busiest day of the year was February 9th with 62 views. Where did the viewers come from? 73 countries in all with views mostly from Canada, the US and Brazil. So now I am inspired! I’m putting a resolution out there to be more disciplined in posting Directly2U, otherwise I will seriously have to think about a new name such as “Lost in Cyberspace”. Wishing you all many blessings for the New Year, abundant joy, good health and deep peace! Welcome back to a new year and a new beginning! I am writing this on Labour Day, grateful for the roles that each of our staff play, their committed service and with profound appreciation for the dignity of all work. Thank you to all our staff who have been working tirelessly to ensure safe, warm places of welcome for learning. The new year brings with it change. This year promises some exciting opportunities. All of us will experience the blessings of new students, staff and programs. • I belong in community. I have a favourite saying, “Where do we grow from here?” This year we will undertake a strategic planning process and all stakeholders will be invited to share their thoughts and ideas so that we can continue to build a vibrant learning community and provide an authentic Catholic education for now and the future. A combination of innovation and responsible stewardship of our resources will be essential. We’ll keep you posted on the process and timelines. To mark the beginning of Catholic Education Week, Monday, May 4 we will break ground for the new Sacred Heart Catholic Elementary School in Rockwood. Minister Sandals and other local dignitaries will join us to celebrate. Sacred Heart will pride itself in 21 Century technologies and shaping hearts for learning and hearts for living. On Wednesday, May 6 each of our secondary schools will participate locally in the province-wide Mass initiative. Building on the success of last year’s province wide mass, this day will receive a new designation, the “Ontario Catholic Student Youth Day”; a special day of unity, worship, evangelization and recognition of Catholic youth. Our youth are embracing the invitation of the Assembly of Catholic Bishops as set out in This Moment of Promise. There are many exciting celebrations of student learning occurring at each of our schools. Check out your school’s website, twitter account, newsletter or call the school for more details. We hope you are able to join us. As we enter this week we pray for our students, that through their education they may be drawn deeper into the love of God and for parents, guardians, educators and religious, that God will bless you in your vocation and all that you do to support Catholic education. Knowing our students is essential. Learning For All, 2011 is full of ideas about how to get to know our students through the creation of class and student profiles. In addition there are great ideas about how to differentiate instruction in response to student strengths and needs. How to differentiate content, process, product, and environment is explored so that educators can ensure all students will be successful learners. Our knowledgeable Program Department staff also provide support to assist staff in expanding and strengthening their repertoire of instructional strategies through a team approach that is responsive to individual students’ learning needs. The evidence is showing that the journey of co-learning is positively impacting student achievement! On a cold and blustery morning we unloaded our suitcases and donation bags in darkness at Pearson for our trip to Neustros Pequenos Hermanos (NPH) Peru http://www.nph-peru.org. It was -33. When we arrived in Lima, it was +33 (with the wind chill) – Bitter cold and dark transformed to abundant sunshine and warmth. And so began a 10 day mission trip adventure, a trip of contrasts, with 20 young adults from Bishop Macdonell High School. These service trips are a part of the fabric and tradition of Wellington Catholic District School Board in partnership with Friends of the Orphans Canada https://fotocan.org. Each of our secondary schools participates every two years. I was privileged this month to be part of this grace-filled opportunity that I had heard so much about. The journey that unfolded was made possible through the organizational efforts and support of many; both those in attendance, and through the generosity of time and donations of staff, families and our community who worked tirelessly behind the scenes. Thank you to everyone for your selfless contributions! It was truly a Lenten journey as we laboured in the desert heat, sacrificing not being tied to electronic devices and witnessing hearts transform. Our projects consisted of laying sod, aerating and fertilizing shade trees, and painting the play structure, therapy clinic, and a delightful underwater mural in the Babies’ Casa. Lathered daily with sunscreen and bug juice our best work was completed by early afternoon before the sun beats down full force at the equator. Our afternoons were filled connecting with the children of the orphanage; playing games, at the beach, impromptu spanish and english lessons, making friendship bracelets… They were joy-filled afternoons filled with an abundance of laughter and each day the personal connections deepened. It was a true gift to share this experience with our students, who simply put, were nothing short of amazing. Their energy is big, inspiring, and their hearts are full. Working elbow to elbow we talked of many things including frustration with large-scale poverty and our resolve to make some kind of difference. There was certainty about some things, confusion about others. We were both worn out and invigorated. The sun set early and the resident rooster made sure we were awake before sunrise. As the week progressed fatigue and aching body parts were juxtaposed with excitement about completing our projects. And although we began the week plotting to kidnap the rooster and transport him to a loving home elsewhere, his crow became less of annoyance and more of a morning cheer of encouragement. Each new day was an invitation to live and serve completely outside of ourselves. While tilling the dusty, compacted soil on our little postage stamp of planet earth I experienced a deep awakening to the hunger for what truly feeds our heart. We have so much more than we need…stuff, lots of stuff. This Lent was a spring cleaning of sorts…an opportunity to offer our excess to those who need it most. It’s easy to stuff the empty places of our heart with junk and filler. This trip offered a chance to give away and go without the many things we do not need. In emptying our hearts a larger space was created for what our hearts are meant to hold. This Lent I’ve been blessed with a renewed spirit and a deeper sense of gratitude. Heartfelt thanks to all who participated so generously in the United Way Campaign. The results are in and in total the staff, students and families of Wellington Catholic District School Board raised $74 178. Remarkable! To Vince Campolongo and Brian Capovilla who championed our District’s efforts, Thank you! Every dollar makes a difference. Today we celebrate each of you!